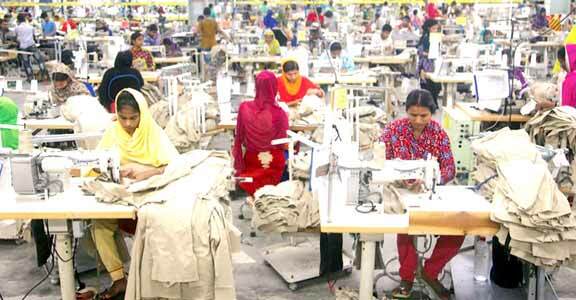 Staff Correspondent: The government has brought changes to some conditions in new wages for readymade garment workers, creating scope for the owners to curtail extra benefits for the workers, labour leaders have said. The labour ministry on November 25 announced the new wages and conditions for the RMG sector workers through a gazette notification setting Tk 8,000 as the minimum wage. After four days of the announcement, the government brought the changes in its announcement through another gazette notification issued. In its first announcement, the government had said that if any worker would get allowance or benefit other than wage and allowance set in the wage board, he or she would continue to enjoy the benefit under the section 2(10), 108 and 336 of Bangladesh Labour Act 2006. According to the corrected version of labour ministry, the worker will enjoy benefit other than wage and allowance set in the wage board if it is offered in accordance with Bangladesh Labour Act, 2006 and Bangladesh Labour Rules, 2015. ‘It is nothing but an attempt to deprive the workers of benefits,’ Amirul Haque Amin, president of National Garment Workers Federation, told. With this provision, the government created scope for the factory owners to cut extra allowances and benefits of workers other than wage and allowance set in the wage board, he said. ‘I do not know what actually has happened but if the changes take effect, the workers will be loser,’ Shamsunnahar Bhuiyan, workers’ representative to the RMG sector wage board, said. Wage board formed in 2013 for the RMG workers also had a provision saying that if any worker would get allowance or benefit other than wage and allowance set by the wage board, he or she would continue to enjoy the benefit under the section 149 and 336 of Bangladesh Labour Act 2006. According to the section 149 of labour act, (1), no employer shall be entitled to pay any worker wages at a rate lower than the rates declared or published under this Chapter to be the minimum rates of wages. ‘We have seen the previous and the changed condition regarding extra benefits for workers in the wage board and there is no doubt that it is one of the new tools in the newly announced wage structure, which will certainly cut the benefits of workers,’ said Towhidur Rahman, president of Bangladesh Garment Industry Workers Federation. Now, the trade union organisations would have nothing to say if, under the new provision, factory owners cut the benefits of workers which were not offered in accordance with labour law and labour rules, he expressed his fear. In the corrected gazette, the labour ministry also included break-down of the wage amount for apprentice workers and employees. An apprentice worker would receive Tk 5,975 as monthly gross pay including basic pay of Tk 2,750, fifty per cent of basic as house rent, Tk 600 as medical allowance, Tk 350 as travel allowance and Tk 900 as food allowance. An apprentice employee would receive Tk 6,164 as monthly gross pay including basic pay of Tk 2,876, fifty per cent of basic as house rent, Tk 600 as medical allowance, Tk 350 as travel allowance and Tk 900 as food allowance. ‘I am not aware about the changes in the wage board announcement and I do not know whether the ministry can bring any change in announced wage and conditions without discussion with the representatives of wage board,’ Shamsunnahar said.